1 of 1 Finely chop 1/2 cup sweetened flake coconut. Fold into batter along with 1/2 tsp coconut extract. To frost: Combine 1 egg white, 1/4 cup sugar, 2 tsp water and a pinch of salt in a double boiler set over simmering water. Cook, whisking constantly, until mixture is foamy and registers 160 degrees on an instant-read thermometer. Remove top of double boiler and beat with an electric mixer until stiff peaks form. Beat in 1/2 tsp coconut extract. 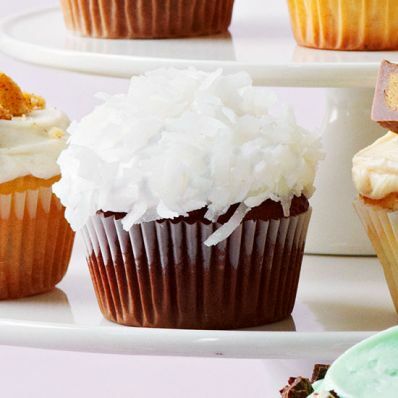 Spread in a thin layer over cupcakes and top with 11/3 cups sweetened flake coconut.